Dying—undergoing it, or helping one who is dying—is a privileged space where we see and encounter God himself. And in dying, the ensouled body serves as a sign of gift and giving, yielding one’s life to the embrace of God. 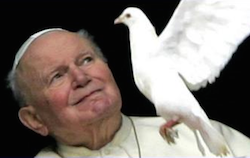 It is a sign that well-illumined the insights of John Paul II’s Theology of the Body. Windley-Daoust recently published a book with more on this topic: Theology of the Body, Extended: The Spiritual Signs of Birth, Impairment and Dying.